Blogger Gary Welsh over at Advance Indiana has been following the Blue Indy contract with the Ballard Administration (see here and here for the latest). He reports that on Tuesday the Public Works Board voted on putting $6 M in a Region's Bank escrow account for Blue Indy to draw down - refusing to take public comments when he requested time to speak. I have embedded the WCTY broadcast of the Blue-Indy escrow account section of the meeting below. From what was said at the Board meeting, the Ballard administration is pooling the $6 M from three funds - the parking meter fund, the city's cumulative capital projects fund, and the rebuild indy fund. Whether this allotment of funding sources is a last-minute maneuver on the administration's part, or was buried in the budget from the get-go is not clear. From testimony by Bart Brown, the Council's CFO, it is clear that the Council did not know of this project and to its thinking, did not appropriate funds for it. What also is left up in the air, is whether the administration cancelled or postponed other projects in order to have enough money to pay the $6 M tab - which is evidently due by Sept 1 according to testimony on the details of the contract in response to a Board member's question. The 2016 budget for the Department of Public Works is up at tonight's Council Public Works committee meeting - beginning at 5:30 pm in room 260 of the City-County Building. Here is the 18 minute clip from WCTY's broadcast of yesterday's CIB meeting - the portion where the Pacers deal for use of CIB land for 40 years (with an option for a 10 year extension) was 'discussed'. The vote was whether or not to pursue negotiations for an agreement, based on the general points to which the Board had access. Presumably it is the same list of points published in Mary Milz' peice yesterday on WTHR. Most questions were asked by City-County Council President, Maggie Lewis, who sits on the CIB due to her position on the Council. She asked great questions, but most were referred to a Pacers press conference supposedly being held in the next few days - so left unanswered. Please note, that the Board President, Earl Goode, referred to "individual briefings" on the particulars. It is too bad that the public does not have access to what the general terms will be, as there is nothing posted on the CIB website, nor was there any presentation to inform the public. I'm still getting up to speed, but Mary Milz, WTHR reporter, is telling us that the CIB voted to move forward to ink down a deal with the Pacers' on their proposed $50 M training facility. Under the deal, the Pacers would get the land east of the Fieldhouse, now used for parking, for $1 a year for forty years, and 240 additional parking spots in the Virginia Street parking garage for free. Meanwhile, the 2014 Pacers agreement with the CIB only has the team guaranteed to stay in town for 10 years (9 more at this point). Milz' report includes what appears to be a handout from CIB meeting this afternoon, sketching out the rough terms of the deal. If the Pacers leave town before the 40 years are up, the CIB may purchase the training facility building for a preset price, or the then-operable market price, whichever is greater. My first question is, why would the CIB give these terms to the Pacers for 40 years, but only extract a ten year commitment to keep the team? Sounds like the Pacers are (oh gasp !) getting a better deal than Indy taxpayers once again. I'll have to wait for the WCTY taping of the meeting to get logged into the archives to hear more. Google "Pacers CIB" and you'll get a raft of links to $160 Million deal with the Pacers in 2014 - yes, just last year - that raised taxes and supposedly had the Pacers in town for another 10 years. WTHR reporter Mary Milz is reporting tonight, that the Pacers will ask the CIB to build them a new practice facility - at what cost they do not say. Its time to pull the plug on all this nonsense. This city gets blackmailed year after year by one after another sports team or venue. JUST SAY NO and lets begin to work on making Indy a great place to live beyond downtown. That will take money, too. It's long past time to invest in the rest of Indianapolis. 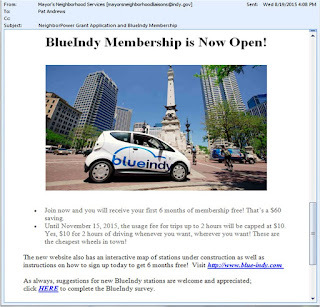 The Ballard Administration is pushing out ads for Blue Indy's electric car rental for profit business. Like many of you, I receive messages from my Mayor's Neighborhood Liaison that sometimes tell you about trash pickup schedules, neighborhood clean ups, public information meetings and other items of interest to residents and neighborhoods. 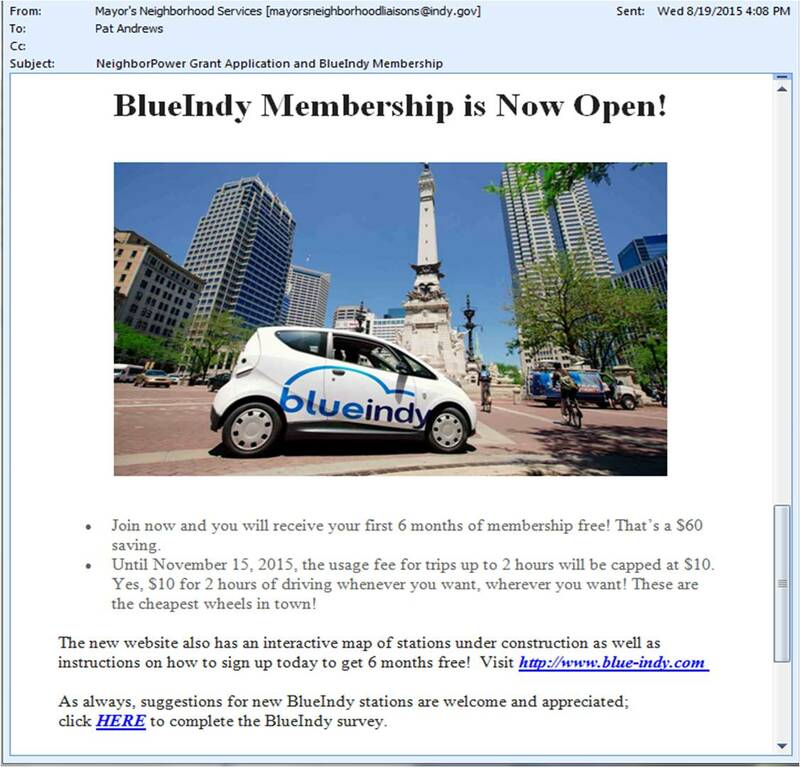 Yesterday I got one from "Mayor's Neighborhood Services" and it contained an ad for Blue Indy. When I posted on Facebook about it, Ted Dobracki mentioned it was the second one. So I scrolled back through my not-yet-deleted emails, and sure enough, I had received an ad for Blue Indy in an email blast from my MNL on Tuesday as well. This isn't right, guys. These email communications are supposed to be for government business, not ads for companies. The Tuesday ad was brief and followed by a note on the rise in stormwater drainage fee - which is where my attention was drawn. The blast list must be enormous. Not to mention the further reach effected when public officials and neighborhood folks forward Neighborhood Services' emails to others. It has actual monetary value to advertisers. This misuse of taxpayer funded communications needs to stop. Hopefully this will be the last ad I get from the City government. Last night began the City-County Council committee work to review, amend, and adopt the 2016 budget. There was one particular item that got a bit of discussion that was quite interesting. You will recall that the last few budget sessions have been punctuated with an ongoing fight over whether or not to eliminate the local homestead credit on property tax bills of homeowners. The Democrat controlled Council has refused to eliminate it all at once and even refused to phase it out. Well, it seems the Ballard Administration has once again turned to the State Legislature to change the rules so that Ballard can get his way. Currently, income tax revenue (COIT) is used to fund the local homestead credit. According to Council Counsel Fred Biesecker, with HEA 1485, COIT can no longer be used in this manner after January 1, 2017. If the Council wants to continue the local homestead credit (LHC) in 2017, it will be forced to RAISE a NEW TAX. The LHC costs $10 M, but only $2 M actually makes any difference in homeowners' property taxes, since so many of us are being protected by the tax caps. But, the remaining $8 M doesn't just evaporate, it lessens the tax cap/circuit breaker impact on the many school districts in Marion County, IndyGo, Health & Hospitals, and the Library system. By upending the current funding source, the Republican controlled State Legislature is reaching into what will likely be a Democrat controlled Mayor's office and forcing it to RAISE TAXES to maintain the status quo. Of course, if a Republican were to somehow win the election, the Legislature left itself a year to 'correct' course so that no such dilemma would have to be faced by a Republican. The upshot is not just having to raise a new tax - it also includes having to wade through the weeds and convince the public that it is somehow wise to raise taxes by $10 M so that members of the public can benefit by $2 M.
This is clever and cursed at the same time. Whenever a local problem is brought to the State Legislature by a Republican, the solution is to do whatever makes the Republican's political life easier. Whenever a local problem is brought to the State Legislature by a Democrat, the solution is to give them the authority to raise taxes. And now we see that when a Republican is likely to be succeeded by a Democrat, the solution is to delay the authority to raise taxes until the Democrat is seated and crafting his first budget.